It is cold, icy, snowy and rainy in the Shenandoah today. School was cancelled so that meant no substituting for me! Yay! I have been away for awhile because I have been busy stitching and working on school assignments. I must admit that I am feeling a bit overwhelmed. I am enrolled in a program for teaching licensure which is truly a blessing. I will be able to get my teaching license in less that 6 months. Naturally, the program is going to be a very intense, fast paced course. I expected that. However, on Orientation Day this past Saturday, one of our professors said that we need to tell our families that we would not see them again until May and that they needed to get used to living in a dirty house. If they cannot live in a dirty house then they need to learn to clean it themselves or move. I giggled of course, but then I saw the assignments. Holy smoke we have THREE research papers due EVERY week. Then we have to peer review nine other papers. Plus we have a group project, plus we have student teaching to complete. So, just suffice it to say that I was crazy with worry. Besides, when would I have time to stitch? Over the past week, I have gotten myself together and tried to formulate a schedule. The schedule consists of doing some kind of school work for several hours a day and then I will "reward" myself with stitching. It seems to be working since I am on track with my assignments and making great progress on Sara. Speaking of Sara, here she is! I only have about a quarter (or a bit more) left to stitch on her. I am hoping to finish her before the end of the month. That will mean that for the first time EVER I have started and finished a project in the same month of the same year! WOO HOO! She has been a joy to stitch (only a few frogging incidents) and quick as well! I have gotten a bit behind on reading my blogs, but I do wish to say thank you to those who continue to stop by and leave such wonderful comments. I promise to stop by soon and visit you too! I hope that everyone has a great day...Happy Stitching! Sara is looking fabulous, great progress! Sounds like you are going to be very busy these next months Valerie. Sara is looking gorgeous. Good luck with the classes and all the papers! Sara has got beautiful colours, just love this sampler. Must be great to visit the museum where the original is housed. Good luck with your study, a real challenge. Sara is beautiful! I've never seen that sampler before--very pretty! Valerie - thanks so much for visiting my blog and leaving a comment! Now I've found your blog and I'm so happy I did. You definitely love to stitch the same things that I do and I'm going to look forward to seeing your progress. Your schedule for the next four months sounds absolutely gruesome, but so rewarding when you're done. You'll find time to stitch (but don't clean that house, let others do it for you! LOL). You'll probably need that stitching time just to keep your sanity. I love Sara - she's beautiful. I don't know if I've seen the sampler before but she's definitely up my alley!! Can't wait to see more progress and to hear how school is going. Sara is going to be so beautiful! Good luck with your course. Rewarding yourself with stitching is such a great way to stay motivated. Photography is my passion. I love capturing memories for my family and friends. 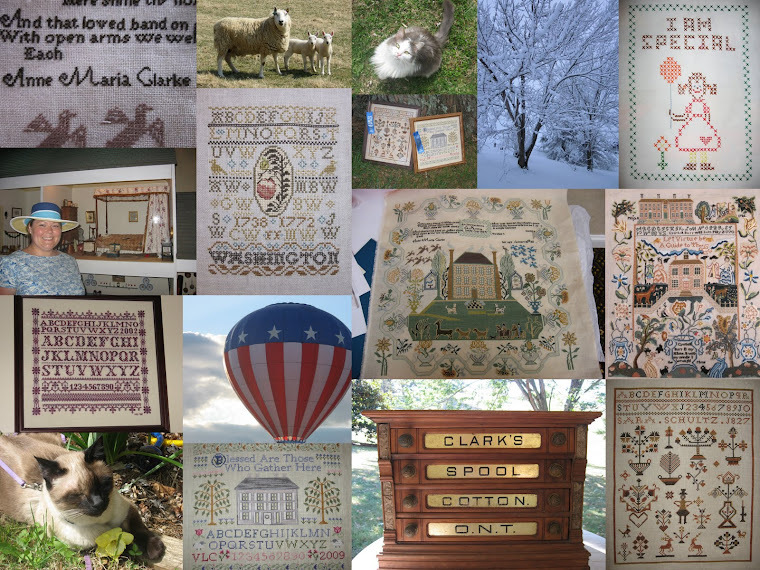 I am lover of samplers - new and old! Stitching, reading, spending time with family and visiting historic places are my favorite pastimes. I have been happily married to my wonderful husband for seven years and have three adorable cats who are like my children. I enjoy sharing my stories and reading what others have shared. Comments are my favorite, so don't be afraid to tell me what you think! Welcome to Sharlotte, Tracey and Ranae! This was my first sampler! Princess enjoying the outdoors like the tomboy she is!